Need an idea for a Sunday afternoon drive? Head north on County Road 413. Drive 1/4 mile north of the junction with Road 770 and you will see some grain bins on the east side of the road. Turn in there and you will see the Salem Presbyterian Cemetery. In 1919 the First Presbyterian Church merged with the Salem Presbyterian Church. The Salem Church building was sold and moved, however, the Salem Presbyterian Cemetery, also known as the Brestel Cemetery, remains at the site and is maintained by members of the Church and family members of those buried there. Most recently Church members Marlin K., Mark Peyton, Archie R., and the Presbyterian Youth Group have kept things in order. The Cemetery contains 37 graves according to records with the first burial, that of Aaana S. Buesing, occurring in 1882. The last individual buried in the cemetery was Bill Rickertsen in 2013. Prior to Bill the last individual buried was Louisa Conrad in 1936. In 1976 the Church conducted a fund raising campaign within the congregation and among family members of those buried in the cemetery. They successfully raised $1,815 to construct a chain link fence around the graves. 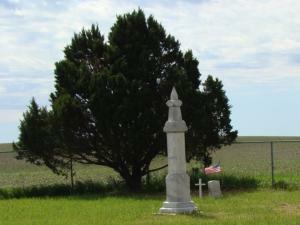 Photos of the cemetery can be seen on the Photos Page. Sandy Brestel provided a pile of papers entitled “A Brief History and Report of Salem German Presbyterian Church and Cemetery”. I’m not sure of the date the report was compiled…however I’m sure, given the hand corrected errors, it was prior to computers and printers, and possibly even white-out. The pile, 11 pages in all, gives a very similar history of the Cemetery to what was provided in the History of Gothenburg from which the information above came from. Within the papers is the report from 1976 – or – 1977 concerning the renovation of the fence surrounding the Cemetery, a list of those buried, a map showing the original family plots (of which, according to the map, there were only 17) as well as a list of 46 individuals or couples who donated a total of $1,815 to the construction of the new fence. Of the moneys donated $1,333.58 was used for the fence, $146 was used to remove some trees (I assume the tree in the north-west corner as there are trees in each of the other three corners), and $335.42 to be placed in a Cemetery Fund to pay for future maintenance. In addition, Mr. and Mrs. Clarence Campbell donated additional money (though it did not indicate how much) to be placed in the maintenance fund. The list of those buried numbers 31, thus missing five, now six, that are known to be buried there. It is stated that lots (not plots….there were 17 lots…multiple plots per lot) were sold for $5/ each, a ½ lot was $3, and a single grave was $1. The payment was to be in cash prior to the funeral service.